This was a tough year for movies and television — we had the weakest box office summer in years, and TV ratings were anemic. Tons of huge, vaunted projects stumbled, and some underdogs thrived. Here are the top 10 lessons we hope the entertainment industry has learned this year. This was the year of directors getting to do whatever they wanted, from relatively small passion projects like Winter's Tale to huge epics like Noah and Interstellar. As the Guardian wrote back in April, as directors have gained independence from the studios, "their movies invariably became longer, looser and more insufferable." The Guardian article points to Seth MacFarlane's comedy Western A Million Ways to Die in the West: "If you need proof that the director has been given far too much control, look no further than the fact that he's cast himself opposite Charlize Theron in the lead role." 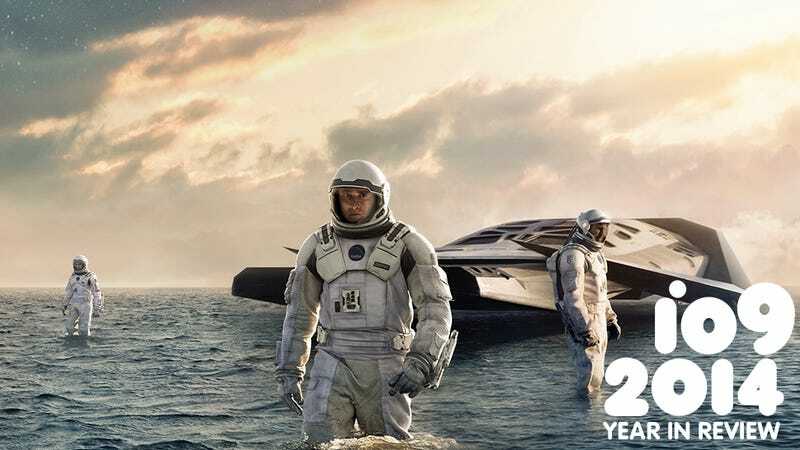 There were a lot of high-concept science fiction shows launched this year, including Syfy's Ascension and Helix, CBS' Extant, TNT's The Last Ship, and the CW's Star-Crossed and The 100. And out of those shows, the ones that had a single clear idea were the ones that seemed to have the most success: A plague has wiped out humanity and a Navy ship is searching for a cure. The human race has abandoned Earth after a catastrophe, but now we're coming back, starting with our juvenile delinquents. Meanwhile, shows like Ascension, Helix and Extant bombarded us with a grab-bag of ideas, and seemed unable to settle on just one. "Halle Berry has a robot kid! And an alien baby! And there's some weird conspiracy." "There's a pandemic, plus zombies, plus immortal silver-eyed people, plus Inuit people, and Seven of Nine is an evil corporate stooge." Star-Crossed, meanwhile, went through a dozen ideas in as many episodes. And it's too soon to talk about Ascension's plot stew, because spoilers. We saw a lot of science fiction this year that felt like a postmodern soap opera, with intense relationships and tons of illogical twists... but no strong focus. This might be the year that reality television finally got too clever, and faceplanted. There were a few high-profile experiments that didn't pan out. First Syfy launched Opposite Worlds, a remake of a Chilean show in which one team of contestants lives in the Stone Age and the other lives in a Space Age futuristic house full of incredible comforts, and then it's sort of like Big Brother. Then ABC had The Quest, which was an immersive fantasy quest series where a group of people act out an epic story — but the contestants kept figuring out plot twists before they were supposed to. And finally, Fox had the highly publicized disaster of Utopia, which was supposed to be a year-long experiment in creating a perfect society in the middle of nowhere. None of these shows did well, and they showed that viewers don't necessarily want to watch elaborate social experiments played out on television. This year, a couple of amazing things happened. Community returned to NBC for its fifth season, with previously fired creator Dan Harmon back in charge — and the show went out on top, creatively if not in the ratings. And then, after NBC finally cancelled it, Community got picked up by Yahoo! for at least one more season. Meanwhile, Nickelodeon decided to pull Legend of Korra from television and release new episodes only via the channel's hard-to-use online video player... but fan demand wound up pushing the network to bring Korra back to television. Creators Michael Dante DiMartino and Bryan Konietzko did an incredible job of keeping in touch with the fans, and responding to fan concerns, spawning a fan base who stuck with the show through all its turbulence. And finally, the show Under the Dome, from the dream team of Steven Spielberg and Stephen King, escaped cancellation because Amazon paid an incredible sum of money to premiere its episodes on Amazon Prime, making the show profitable even if nobody watches it on CBS. Did you know that Transformers: Age of Extinction had made more than $1 billion worldwide? Probably not, since it underperformed in the United States and is currently listed as the least successful Transformers movie domestically on Box Office Mojo. In fact, T:AoE is one of the top 10 most successful movies of all time in terms of worldwide box office, and one of only 19 movies ever to break the $1 billion barrier. Partly, this is because audiences in Asia love giant robots and huge special effects sequences — but Transformers also went out of its way to set a big chunk of the movie in Hong Kong, just to make sure. In a year where U.S. box office receipts were disappointing across the board, it became more important than ever to win over the Asian market. This was the year of the religious epic, and it seemed as though the lucrative Christian audience mostly stayed away. Aronofsky's Noah did okay, not quite making back its production costs in the U.S. but probably breaking even in worldwide receipts. But the Left Behind remake starring Nic Cage seems to have gotten (sorry) left behind. And Ridley Scott's Exodus has joined his Robin Hood in the ranks of lavish costumed dramas that crashed and burned, at least domestically. One of the year's biggest disappointments was the Vampire Academy film, which joined last year's Mortal Instruments and Beautiful Creatures in box office oblivion. None of these films really pleased fans of their book source material, because they skewed too campy — but they also showed that the audience isn't necessarily there for young-adult fantasy stories with elaborate, gothy mythologies. Meanwhile, the Maze Runner and Divergent films did surprisingly well with their Hunger Games-inspired dystopian action. The only dystopian young adult adaptation that didn't do so hot was The Giver, which made too many story compromises in an attempt to capture that sweet Hunger Games money. We kind of learned that already with the Total Recall film, but we learned it all over again this year. When you see a movie called RoboCop, you kind of expect a Paul Verhoeven/Ed Neumeier-style over-the-top satire of corporate dickishness and urban renewal, with an undead cyborg who doesn't remember who he used to be. When you see a movie with "Dracula" or "Frankenstein" in the title, you want Count Dracula lurking in castles and sucking people's blood, or the story of a mad scientist creating new life — not whatever the hell Dracula Untold and I, Frankenstein were. I still can't get over the fact that we had two Hercules movies and neither of them had Hercules in it. Meanwhile, Godzilla reaped a huge amount of goodwill simply by having Godzilla in it, unlike the 1998 movie of the same name. Everybody wants synergy across different types of media right now, because traditional media is stumbling. And we just mentioned how shows like Korra, Community and Under the Dome were saved by Internet venues. But there are limits to how much you can coordinate between a TV show and another platform, before things start to break. This past summer, Syfy finally admitted defeat on its $100 million Defiance experiment, combining a TV show with a video game, when the Defiance game went free-to-play. And this was the year that we really saw Agents of SHIELD pay a huge price for its coordination with the Marvel movies, waiting until April's release of Captain America 2 to drop a shoe that had been hovering in mid-air since the show began. Obviously, the biggest lesson this year came from Sony's attempt to turn Spider-Man into a universe full of spin-offs and tie-ins, or a miniature version of what Marvel Studios has painstakingly built at the movies. Before Amazing Spider-Man 2 came out, we heard a lot about how we were going to get ASM3 and ASM4, plus spin-offs featuring any character who had ever stood in an elevator with Peter Parker. And then, ASM2 felt like a bloated mess, in part because it was trying to set up a Secret Six spin-off instead of telling its own story. So it would be tempting to draw a simple lesson about the perils of rushing to create a "mega-franchise," especially one built around only one character. But I think the lesson is a bit broader — ASM2 underwhelmed, in part, because it was the most "superhero-y" of all this year's superhero films, in a way that seemed formulaic. Captain America 2 was a 1970s political spy thriller, Guardians of the Galaxy was a bright space opera, X-Men: Days of Future Past was a dystopian time-travel epic, and Big Hero 6 was a zany film about mad science and robots. On television, Gotham scored points for being mostly a crime drama, and the CW took its time to earn the superhero trappings of Arrow, before rolling out the overtly comic-booky The Flash. Superhero stories are actually a grab-bag of different genres, and if they're going to keep succeeding in mass media, they need to take full advantage of all the possibilities they contain. Thanks to Lauren Davis, Annalee Newitz, Lynn Rapoport and everybody else who helped with this!